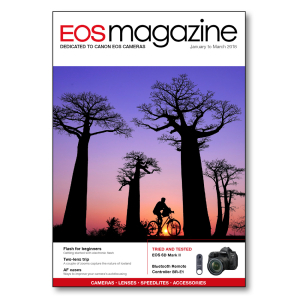 Add this issue to your photographic library for information on the Canon tried and tested EOS 6D Mark II, Bluetooth Remote Controller BR-E1, getting started with electronic flash, ways to improve you camera's autofocusing plus lots more. The Quick Check tool in Canon's Digital Photo Professional software provides a quick way to sort through hundreds of images. Richard Laidler shows how the HDR Tool in Canons Digital Photo Professional software can be used with a single image. The focusing set-up on advanced EOS camera can be highly customised. Case settings offer a quick way to optimise your camera's performance. We have hunted down some of the lesser known camera functions and explain why some might - or might not - be useful. The folder options found on most EOS cameras allow you to sort images at the time of shooting. The EOS 6D Mark II is a more affordable full-frame addition to the EOS range. We take a look at the camera and some of its features. We test Canon's latest remote controller, which uses Bluetooth to transmit a wireless radio signal. Robert Birkby feels the benefit of packing light on a trip to Iceland. Robert Birkby enjoys using neutral density filters for a wide variety of subjects. Gregg Jaden pushes himself and his camera gear to the limit in the world's largest cave. Despite ever-increasing range ISO value there are still plenty of occasions when you might need to use flash.